The holiday season can be hectic with all there is to manage. We know how hard it can be to keep track of every detail when they start to accumulate like snow drifts. So we’re extending our registration deadline for our 2019 Mystery Project Club registration through the end of the month. And to help you better understand what kinds of projects you could expect to work on, we thought we’d share a peek at the patterns that were a part of our 2018 Club. These patterns were designed to use a Green Mountain Spinnery yarn along with a custom spun yarn that we produced here at our Mill. Throughout this past year, our club members received information about these four fiber producers and their flocks along with their project. In February last year, we shared Cap Sease’s Polar Teddy with our club members. 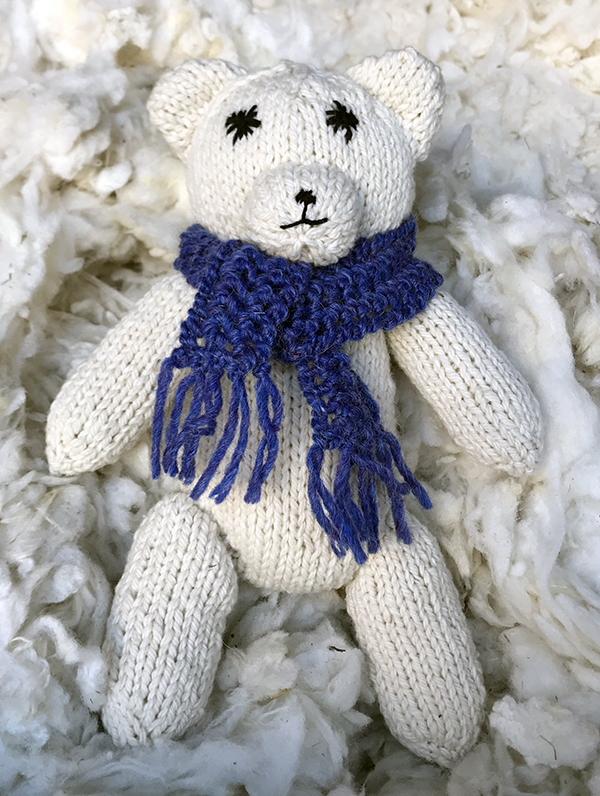 This darling little stuffie was created with downy soft Catskill Merino yarn and filled with our carded fleece. In late April, we sent Larisa Demos’ Cirone Shawl, named after Jenny Cirone who was the original shepherd of a flock that still thrives on Nash Island off the coast of Maine. This little crescent shawl pairs Nash Island Tide yarn with Spinnery Alpaca Elegance. 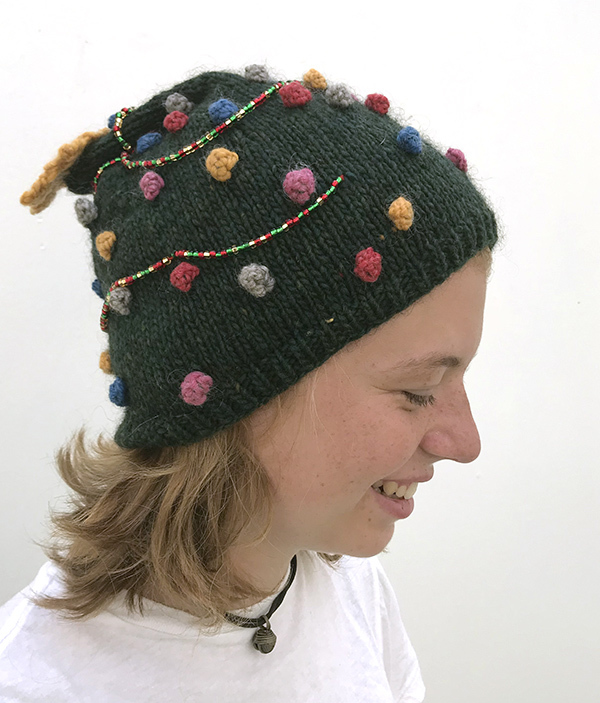 In July our members received a package that included all the materials they needed to make Kate Salomon’s Lopez Island Cap. 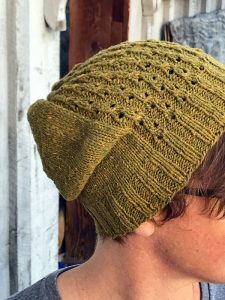 This double layer lace beanie incorporates an unusual construction that pairs Spinnery Meadow as a soft inner layer and Island Fibers’ Rustic Sport yarn as a hearty lace outside. 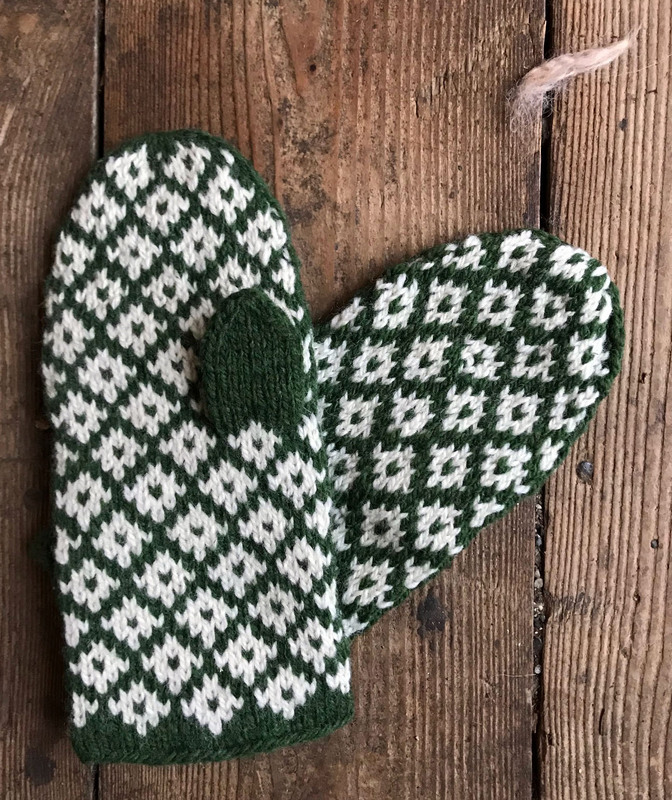 Finally, in October we sent out the news about Maureen Clark’s Swedish Mittens which pairs our Weekend Wool with Meadowood Farms’ 2-Ply Lamb’s Wool. 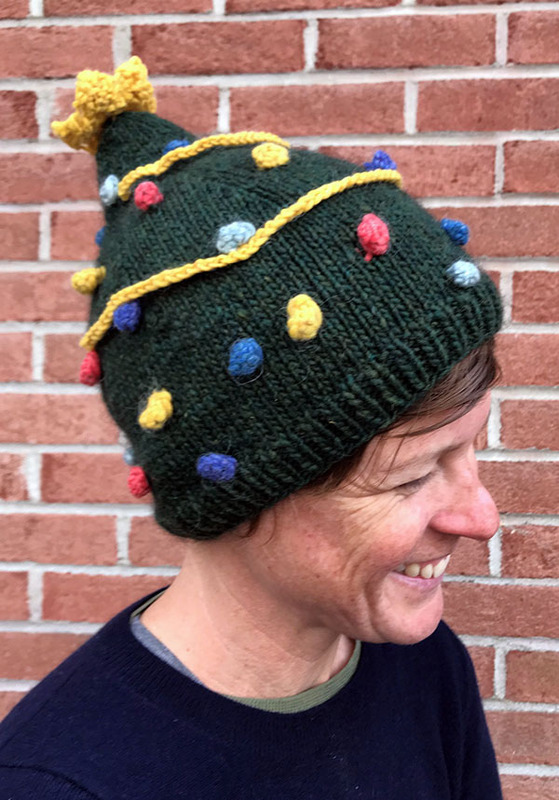 This traditional stranded mitten pattern arrived in time for holiday gifting and may have ended up under a number of Christmas trees. These patterns will be made available to the public later this month, so you’ll be able to find them here on our website and on Ravelry for individual purchase. The patterns we’ve designed for our 2019 Club members will be similar in nature to these designs. They will be small accessory patterns that involve 2-3 skeins of yarn. 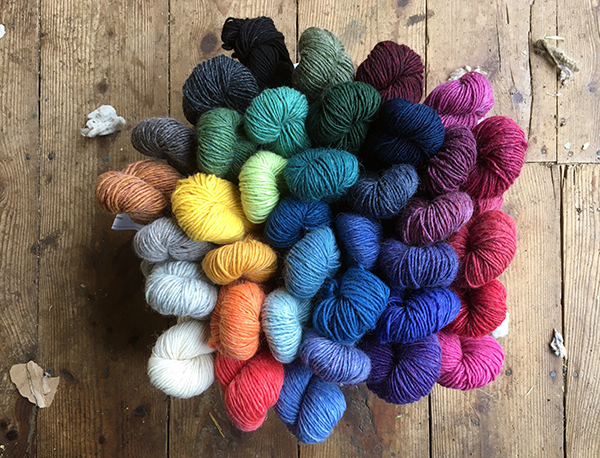 And this year, we’ve partnered with several of the independent dyers we spin for and our 2019 projects will include hand-painted skeins in custom made hues exclusively available to our club members! More information, and our registration form for the 2019 Mystery Club can be found here. If you’d like to purchase membership as a gift for a friend, or would like to receive these packages overseas, give us a call at 800-321-9665 and we can gather all of the details over the phone. We hope that a few extra weeks will make it easier for you to get signed up, so that you won’t have to suffer from the fear of missing out as our first packages begin to arrive later this winter. Happy New Year! We’re very happy to announce that we’ll be part of the fun of the 2nd annual Boston Farm & Fiber Festival. Mark your calendars for Febraury 10th 2019! 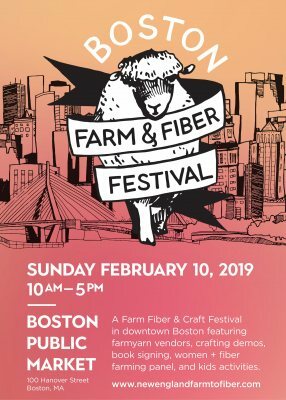 This very special one day event brings some of our favorite fiber producers together in one convenient spot in downtown Boston. You’ll find locally sourced skeins of all kinds (many of which were spun at the Spinnery). And this year, we’ll be participating as vendors and share a new bulky weight limited edition yarn that we’ve spun up just for the occasion. It incorporates 100% New England sourced wool and was spun here at our VT mill; Super duper local! This yarn is a 100% wool put up in 4 oz. skeins of approximately 112 yds each. It can be used for all of our patterns that call for our Capricorn yarn. 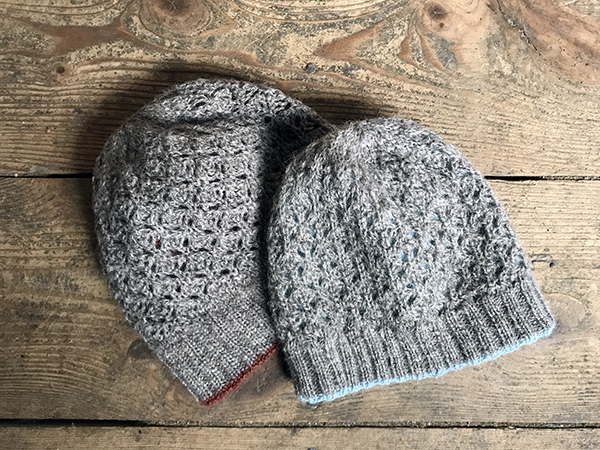 A couple of our favorites, the Capricorn Caps and the Steps & Ladders Hat can create 2 adult hats with 2 contrasting skeins. We’ll be using the intervening weeks to hand paint a few dozen of these variegated skeins in lush irresistible colors for the event. We hope that you’ll be free to come enjoy the day with us. We’ve updated our 2019 calendar so that you’ll be able to mark yours with all of the wooly gatherings we have planned for the year. In just over a week, our January Sale will begin! Soon to arrive in your mailboxes (email or actual) will be our annual Sales Flyer! 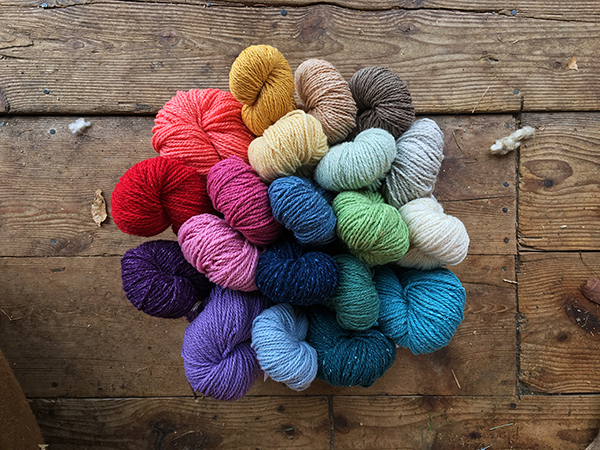 From Monday January 7th to Friday February 8th, 2019 we’ll have special discounts available on some of our most popular yarns! You can find a copy of our flyer here. You may want to plan your purchases by reviewing your pattern options and making sure that you’ll have the yardage you need! For those of you shopping online, be sure to shop among the SALE ITEMS, to ensure proper savings. (Those listings won’t be visible on our website until our sale begins on January 8th). You’ll find small quantities of additional yarns and colors among the yarns featured there. 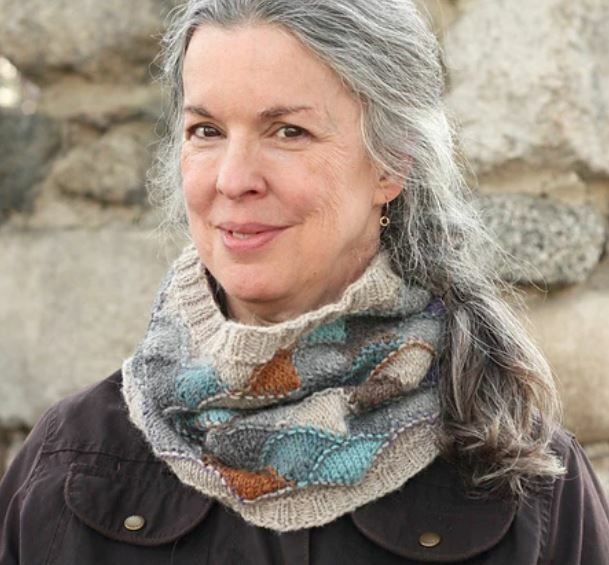 We are excited to announce that Julia Farwell-Clay will be the featured instructor for the Spinnery’s 2019 Sugar Season Knitting Retreat. Julia brings to her knitting students an abundance of knitting experience and a boundless enthusiasm for the craft. Her distinctive patterns can be recognized by their graphic interest and a modern twist on traditional color techniques. She will share with us her current passion for intarsia colorwork, refreshing this classic technique through fresh applications. We’ll begin with an intarsia introduction, then we’ll learn more about her eddy shells (shown in the cowl above). On Sunday, we’ll conclude by working on a beautifully simple and graphic mitten in the round, practicing various stranding options and possible embellishments. Your registration fee of $375 per person includes three meals (Friday dinner, Saturday lunch and dinner) and nine hours of instruction on March 15th – 17th, 2019. This year’s event will be held at the Hampton Inn in Brattleboro. We have a block of rooms reserved for you at the discounted rate of $125.00 per night. Please contact the Hamp­ton Inn to make your reservation using the code “Spinnery”. These rooms are limited so register early! This is a retreat in the truest sense: a weekend away, moments of peace and quiet, a chance to visit Vermont with your needles and yarn and knit with like-minded crafters who are equally excited about learning new tips and techniques from one of our favorite designers. Space is limited, so you’ll want to register as soon as possible, before our spaces fill. You can find our registration form here. We know how hectic the holiday season can be. With all of the hustle and bustle it can be important to carve out a bit of quiet crafting time to preserve your equanimity. So this week we have an unusual treat for you, so that you can do just that. Our friends at Verb for Keeping Warm are in the midst of a special podcasting project that will tell the stories of all of the fascinating fiber folks featured in their stunning Fall 2018 Lookbook, over the course of 7 episodes. In the first episode, we meet Sally Fox. 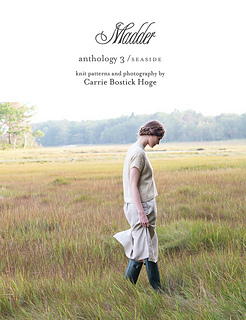 She is the Californian farmer who raises the organic red cotton and the sheep who grow the wool used in the yarns featured in this collection. In the second episode, we follow the wool from the farmer to the mill. Kristine describes how the wool is prepared for the mill and Adrienne speaks to David Ritchie, co-founder and current co-op member of the Spinnery. David walks listeners through our production process giving you an unique chance to hear from someone with over thirty years experience talk about what it’s like to spin yarn for such mindful customers as the folks at Verb. We think that his passion for fiber and what we do here at the Spinnery is just what you need to recharge your holiday cheer. 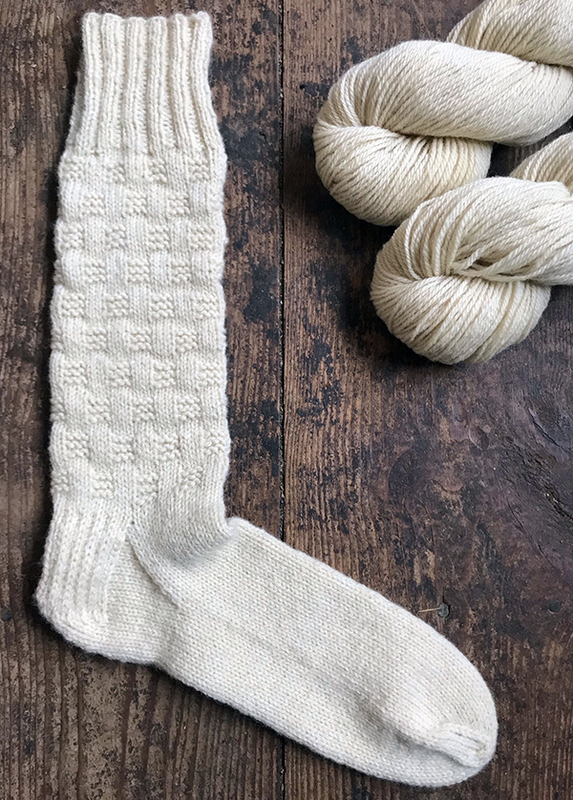 We hope that you’ll set aside an hour at some point and treat yourself to story that will remind you of how magical yarn can be and how lucky we are to work with fibers that can knit us all together with hope for a brighter future. Brew a delicious mug of something comforting, grab your knitting and enjoy! Great news! Registration for next year’s Mystery Project Club is officially open. Because of the fun we had with our club members in 2018, and the wonderful feedback we received from our delighted members; we’re going to again feature four projects that pair Spinnery yarns with those that we spin for our custom customers. This time around we’re partnering with several indie dyers we work with! With each mystery project, you’ll work with two yarns, both created here at the Spinnery: a custom spun yarn that will be dyed a unique hue just for our club, and one of the yarns we’ve created for our shop. Along with a fun new project, these deliveries will give you a unique opportunity to learn a little bit more about the wonderfully creative indie dyers and fiber folks we have the pleasure to work with. Each design will create a different kind of accessory. In years past we’ve crafted hats, cowls, mittens, and more! And as a Project Club member, you’ll have private access to these patterns until they are made available to the public in 2020. As a Club member, you will receive four exclusive projects sent quarterly. Shortly before each delivery you’ll receive an email revealing the details of the project. 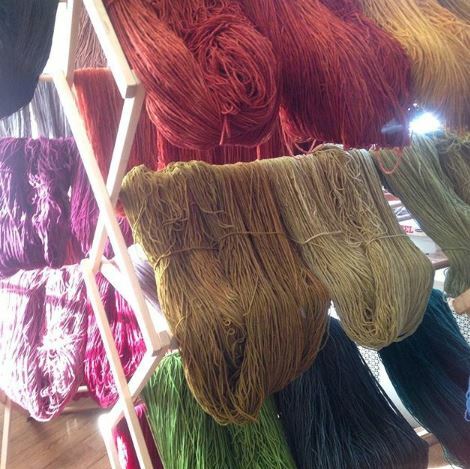 We’ll share with you a unique look behind the scenes of how your special skeins were created. 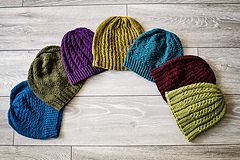 Your four project packages will include the pattern, all the yarn needed to complete your project, and a little gift. Your first delivery also includes a Spinnery project bag to keep everything organized. Membership is $223 and registration is open until Friday January 11th. You can sign up online here or give us a call at 800-321-9665. We want to get your holiday season off to a fun start this year with a project that makes us smile. Who doesn’t enjoy a good Ugly Christmas Sweater? They can be cringe-worthy and the life of a seasonal gathering. We’ve even seen them as Halloween costumes! But we can’t help but think that it’s probably not the kind of project you’d want to hand knit. All that stitching time for a garment that may only be enjoyed a few times a year. Our friend Cap Sease found the perfect solution: An Ugly Christmas Hat! All the fun, and a fraction of the work. Her design features Mountain Mohair, so this beanie will be warm enough to keep you snug as you go caroling around the neighborhood. 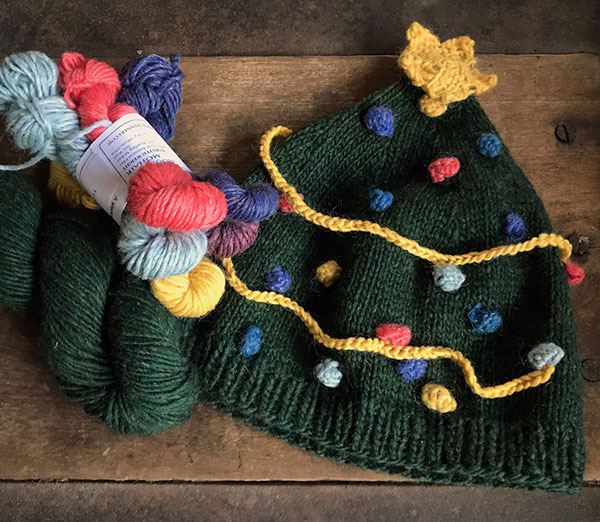 The pattern calls for a full skein for the tree and less than 30 yards of at least five different colors for your ornaments, garland, and tree topping star. To make it as easy for you as possible, we have a limited number of project kits available that include the pattern, a full skein of Balsam Mountain Mohair, and five mini skeins of some of our favorite contrasting colors of Mountain Mohair to make the hat seen above. These are available for $32.75 while supplies last. We can think of myriad ways to make your Big Ugly Christmas Hat unique. You may want to consider using up stash yarn to make your ornaments more diverse. You could create a beaded garland for more pizzazz (as seen above). Cap has also suggested weaving in a bit of tinsel or even adding battery powered micro lights for even more holiday flair. We can’t wait to see how these hats become personalized. We hope that you’ll join in the fun and that this project brightens your holiday season to come! To celebrate the 40th annual Putney Craft Tour this weekend, we’ll be offering a very special limited edition yarn. The wool for this yarn was shorn from rams which had spent the summer grazing on the Putney Mountain summit. For many years Putney Mountain Association volunteers had been trying to control invasive glossy buckthorn by cutting it back, but the buckthorn continued to thrive. If not kept at bay, the buckthorn could grow 20 – 30 feet tall, compromising the beautiful vistas from the Putney Mountain summit, and interfering with the clear views required for the annual hawk watch. David Ritchie, one of the founders of Green Mountain Spinnery, knew on good authority that grazing animals were being used in public parks and many other situations to control invasive species. 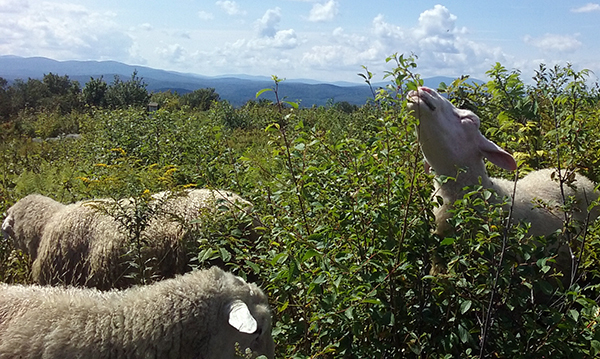 Searches on the internet revealed that goats were the preferred animal, and in 2014 goats from The Goat Girls, Amherst, MA, spent part of the summer grazing buckthorn on the summit. 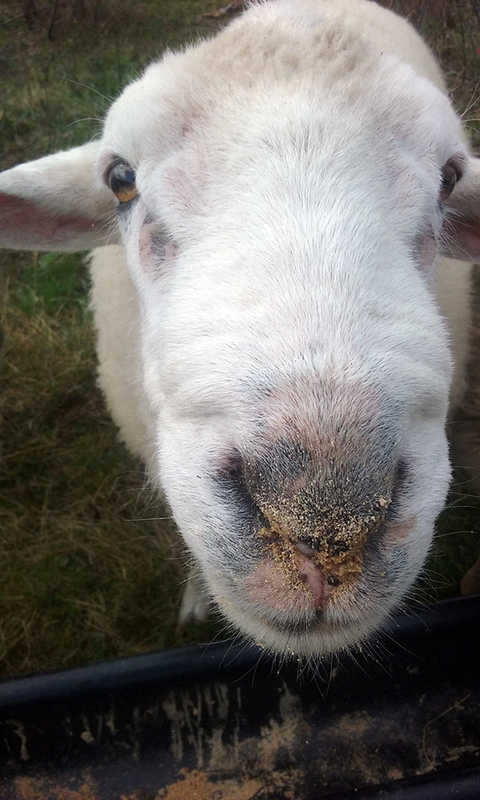 The rest of the summer, sheep from David Major’s flock in Westminster West took on the job, and for each of the following summers his sheep have been on the summit, with a contingent of volunteers making sure someone checks on the sheep daily, providing water and a bit of grain to keep them happy. We’re happy to report that the buckthorn is well under control. And we have some spectacular skeins of yarn from these rams’ fiber to share with you. 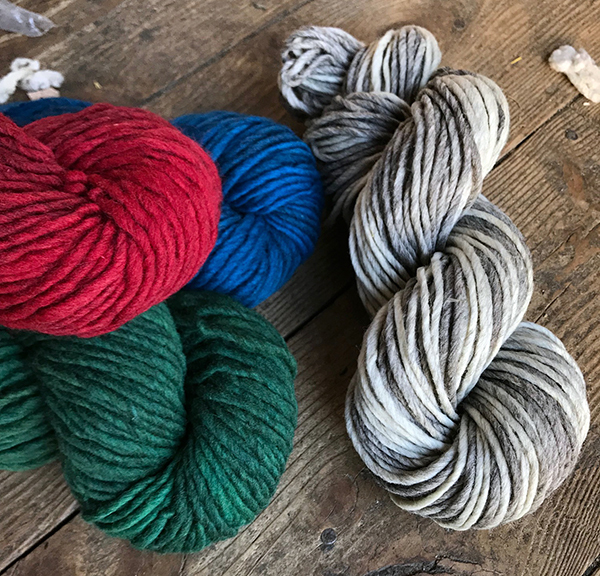 Profit from sale of this yarn will go to Putney Mountain Association, a conservation organization founded in 1945 with 40 acres, and now conserving over 700 acres of beautiful undeveloped land, open to the public for education and enjoyment. Our micro batch of Ritchie’s Ram yarn is a bouncy 3-ply aran weight yarn. The 4 oz. 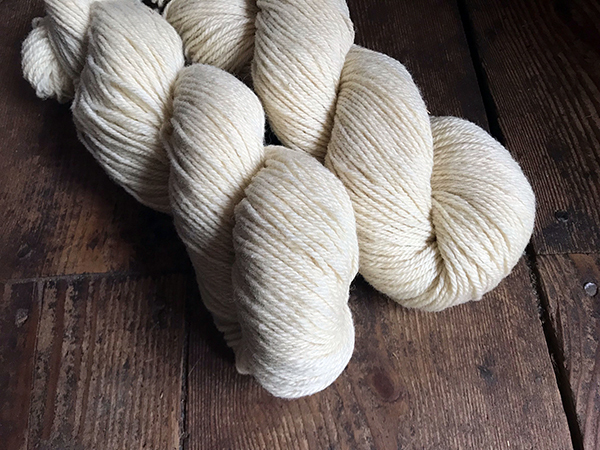 skeins include a generous 230 yards of creamy white undyed wool. It will knit up beautifully into hard wearing garments, as resilient as the rams themselves. These skeins are $14.25 each and will be available only at our Mill shop due to their very limited quantity. You can purchase them in person this weekend while we have special opening hours for the Putney Craft Tour. While you’re here, you can enjoy a FREE tour of our production facility and perhaps pick up one of our collection of shop samples that we’re making available for purchase. That’s right, a brand new garment without the need to work a single stitch yourself! It’s the perfect time for a visit. P.S. For those of you who would like to support this worthy cause with the purchase of this yarn but who won’t be able to make it to Vermont this weekend, give us a call at 800-321-9665 and we can ship your skeins to you next week! 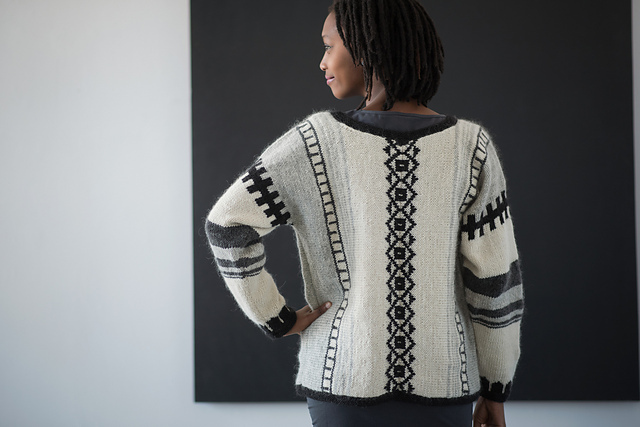 We’re digging out from our first snow storm of the season which makes this the perfect week to introduce you to our newest sweater pattern: Bea’s Cardigan, designed by Melissa Johnson. This beautiful sweater pattern is named for one of Melissa’s former students and now dear friend. 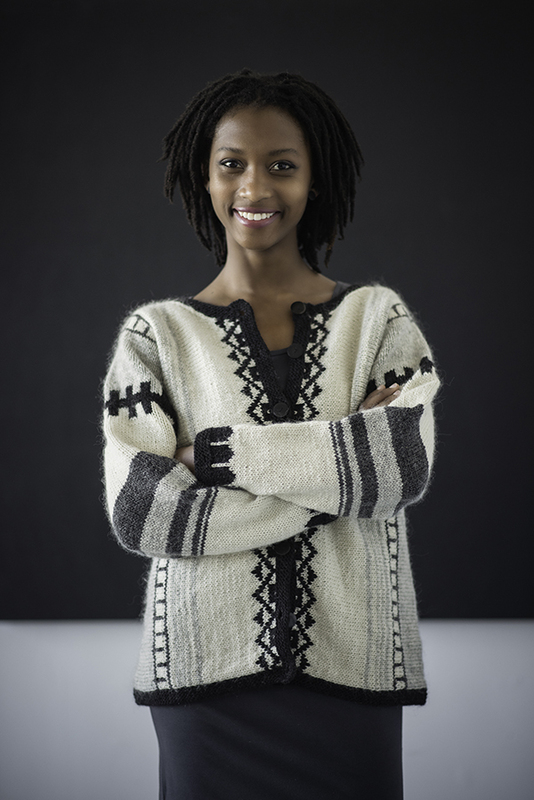 This sideways cardigan features geometric patterns inspired by African motifs and Fibonacci sequence stripes on the sleeves. The sweater is knit in two pieces from sleeve cuff to center of body, then joined at center back with three needle bind off. Sleeve length can be easily adjusted. A gauge swatch is suggested so that you can make adjustments that will ensure a perfect fit. Melissa has a knack for creating stunning color work garments using her favorite Spinnery yarn, Mountain Mohair. 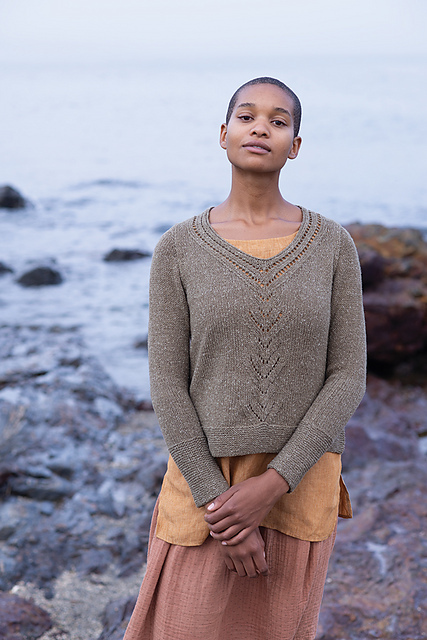 The soft halo of the 70/30 fiber blend creates especially comforting fabric; and we love how the feminine fuzziness beautifully balances the crisp and clean geometric designs. Her pattern includes a size range from approximately 36 (42, 48)” / 91 (106, 121) cm finished chest measurement. The pattern calls for Mountain Mohair 2 (3, 3) skeins color A, 4 (5, 6) skeins color B, 1 (2, 2) skeins color C, 3 (3, 4) skeins color D. Shown above in (A) Jet Black, (B) Edelweiss, (C) Raven, and (D) Blizzard Mountain Mohair. The pattern includes a schematic to clarify the unusual construction and charts for all of the color work. 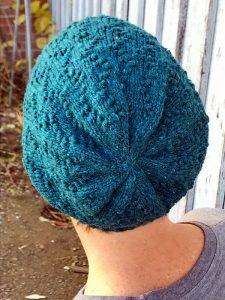 It is perfect for knitters who are still developing their stranded color work skills because each design calls for an easily managed two colors at a time within a row. 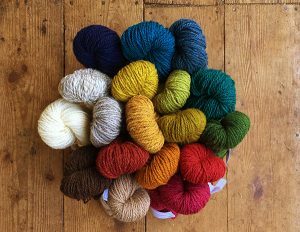 And just think of the color combinations that can be created with the myriad colors available in the Mountain Mohair line! You could work soft neutrals as Melissa did with her sample, or you could play with a brighter tonal version working with four shades of blue, green or purple. The possibilities make our mouth water. We hope that you take a closer look at Bea’s Cardigan. It is just what we want to curl up in this week as the snow begins to fly! We have one last fiber festival scheduled this season. 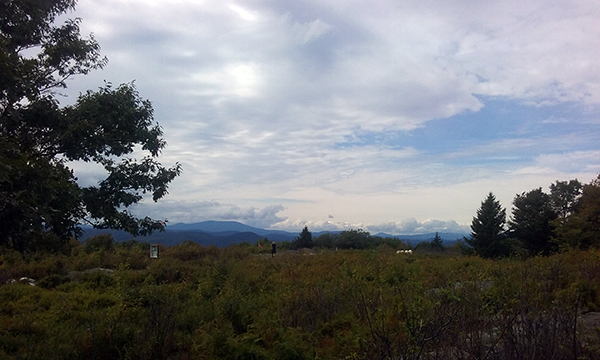 This weekend, Maureen and Kate are in Asheville, North Carolina for SAFF. The Green Mountain Spinnery booth is in an exciting new location; you’ll be able to find our beautiful yarns in booth 326-328. We hope that if you’re in the area, you’ll stop on by and see all that we’ve been working on this season. In addition to our entire collection of yarn and patterns, we have 10 shades of our new DK weight Ragg-Time yarn to show you. And to support this new yarn we’ve developed a half dozen patterns that call for this fun variegated 2-ply yarn. 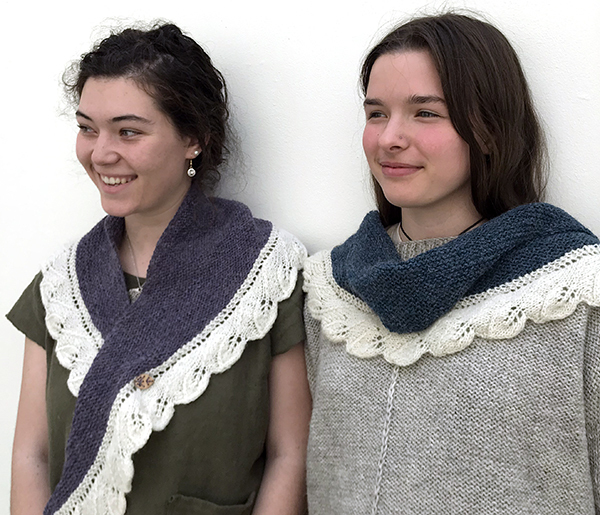 Just this week, we’ve released a new design of Larisa Demos’: her Knotweed Wrap. 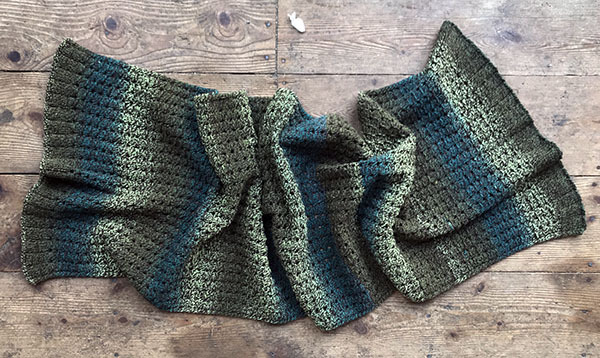 This beautiful textured wrap calls for three skeins of our DK weight Ragg-Time. Shown here, it’s knit up with our Joplin colorway. As you can see, the colors shift through three tones of beautiful green that is plied with a contrasting dark chocolate brown to create a new take on a traditional ragg yarn. The changes in tone can jazz up your knitting, keeping you engaged while you progress. 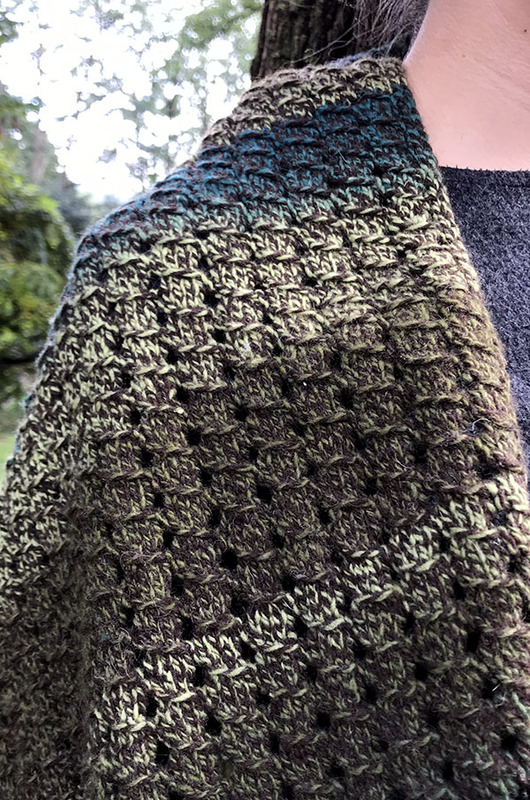 This lovely textured stitch is created with a quickly memorized sequence of four rows that you’ll find start to accumulate as quickly as Japanese Knotweed is able to grow! We hope that you’ll visit our booth at SAFF, swing by our Mill in Vermont, or check out this pattern on our website. It could be the perfect pattern to inspire you to cast on with our new Ragg-Time yarn, bringing some welcome improvisation to this season’s knitting.